Successfully Added Video Glasses - Movies, Games and More on 40 Inch Virtual Screen to your Shopping Cart. Big Screen Display That Fits In Your Pocket! Imagine being able to watch movies or play video games on a 40 inch cinema display while on the bus, in a park, or in the subway station… Well, this dream has now become a reality thanks to these amazing portable video glasses. These video glasses work by using the left and right eye display to produce a 40 inch virtual cinema screen that will make you feel as if you are actually sitting in a real movie theater. The glasses themselves are lightweight and comfortable enough to wear for extended periods of time and feature an advanced micro LCoS screen which has been carefully engineered and fully tested to ensure no harm to your eyes is ever possible. 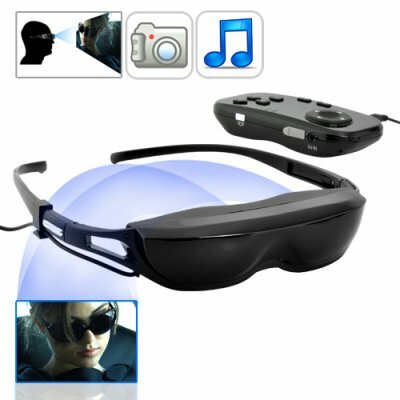 The video glasses connect to a powerful handheld media player that is capable of handling a wide variety of media. Everything from movies and photos to eBooks or even your favorite videos games by Nintendo and Sega can easily be played by the handheld media player. The player also features 2GB of internal memory for storing all your favorite media files as well as a SD card slot that can accept up to an 8GB SD card. This brings the total storage capacity up to an amazing 10 GB! Additional file formats may be supported. However, only the formats listed are guaranteed to work. Can I play original Nintendo and Sega games I downloaded online? Yes. While we can not guarantee compatibility with every game out there, we can safely say that over 90% of the ROMs you download will play just fine. Can I connect my iPod to this device? Yes. You can connect any device with a video out connection to these video glasses. You will just need to purchase an adapter cable from your local electronics store. What a wonderful gadget!. I'm a teacher and I use it at work in my free time, to prepare classes, review students material and occasionally just relax, others dont really know what I'm doing, amazing what a pen in my hand implies... I am so impressed with the service, delivery, and products of ChinaVasion. I cannot recommend them highly enough! on 2010-08-05 20:05:12 It's Awesome!! I really enjoy the video glasses! I had them playing right out of the box, and it's so easy to add my favorite movies in avi. format. My 11 yr old daughter loves them on drives!